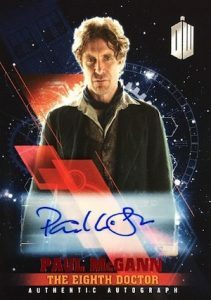 Focusing more on the various storylines of the show, 2016 Topps Doctor Who Timeless builds on the earlier release, which concentrated more on the characters. Each hobby box promises two total autographs or relics. 100 base cards chronicle the most notable time-traveling moments in the series and are joined by Green Foil (1 per pack), Blue Foil (#/99), Purple Foil (#/50), Red Foil (#/25) and Gold Foil (1/1) parallels. Offering the biggest draw for many collectors, over 40 signers are featured on the Base Autographs. In addition to a mix of parallels, there are also Dual and Triple Autographs. 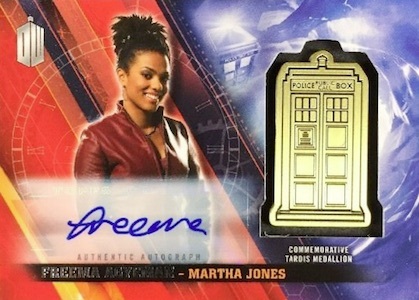 Showcasing show-worn pieces like The Eleventh Doctor's football shirt or River Song's black dress, new Costume Relics and limited Signed Costume Relics provide more premium choices in 2016 Topps Doctor Who Timeless. 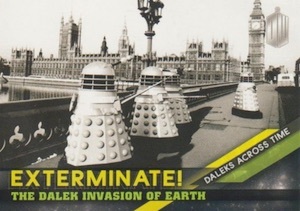 Finally, the hits are rounded out with another batch of TARDIS-themed inserts. 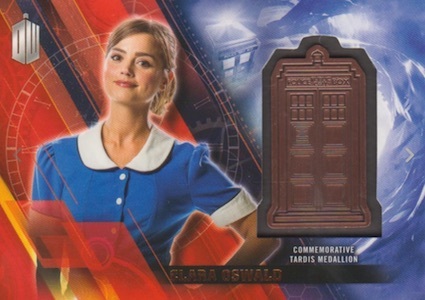 TARDIS Medallions total 36 cards and include Bronze, Silver, Gold and Platinum versions as well as very limited autographs. 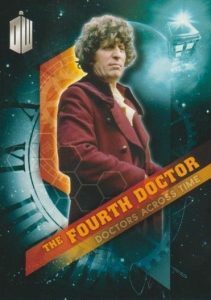 2016 Topps Doctor Who Timeless set collectors have five additional options with the basic insert sets. 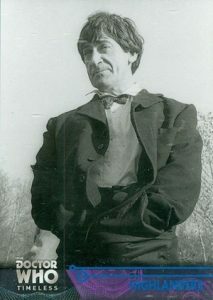 This includes Companions Across Time, Daleks Across Time, Historical Figures, The Doctors Across Time and Time Travelers. PARALLEL CARDS: Green Foil (1 per pack), Blue Foil #/99, Purple Foil #/50, Red Foil #/25, Gold Foil 1/1, Printing Plates. PARALLEL CARDS: Blue Foil #/50, Purple Foil #/25, Red Foil #/10, Gold Foil 1/1, Printing Plates. PARALLEL CARDS: Blue Foil #/99, Purple Foil #/50, Red Foil #/25, Gold Foil 1/1, Printing Plates. 36 cards. Serial numbered #/150. PARALLEL CARDS: Silver #/25, Gold #/5, Platinum 1/1.